Using the Chandra X-ray Observatory, a team of scientists led by researchers of the APC laboratory in Paris, and SAp/CEA Saclay, France, has been studying the diffuse X-ray emission coming from a region close to the center of our Galaxy. The rapid and complex variations they observed can only be created by an intense X-ray radiation reflected by the dense molecular clouds of the region. The required radiation can only have been produced by the central supermassive black hole undergoing multiple periods of intense activity in the past. The paper reporting these results has been published in Astronomy and Astrophysics (Clavel, M., Terrier, R., Goldwurm, A., Morris, M., Ponti, G., Soldi, S., Trap, G., 2013, A&A, 558, A32, arXiv:1307.3954) and it is one of the highlights of the A&A 2013 October volume. Sagittarius A* is the supermassive black hole at the Galactic center. It is located at about 26,000 light years from the sun and is one of the least luminous known supermassive black holes of the Universe. Nevertheless, there is evidence that this object has been more luminous in the past, between several decades and a few hundreds years ago. This past activity can be studied from the reflection of its X-ray component by the dense molecular clouds surrounding Sagittarius A*. Indeed, it takes longer for the emission to travel from the black hole to the cloud and then from the cloud to us than to come directly from the black hole. Thus, the reflected radiation is reaching the Earth with a delay compared to the direct emission from the illuminating object (which is already seen about 26,000 years after it is emitted) and thus it appears as a light echo of an activity that has been quenched since then. If measured in great detail this echo allows us to study the past behavior of the black hole. When the high energy radiation hits the cool molecular gas of the cloud it is partly absorbed by the gas and partly scattered away. A fraction of the absorbed radiation is re-emitted as fluorescence light at specific energies corresponding to the difference of the electron energy levels of the atoms involved in the absorption and re-emission processes. One characteristic fluorescent line, which is expected to be particularly intense, is the one corresponding to the first two energy levels of the iron atom at 6.4 keV in the X-ray band. This X-ray line and the associated scattered continuum emission (the so called reflection component) have been indeed observed by the large space X-ray observatories presently in operation, notably the European INTEGRAL and XMM-Newton satellites and the American Chandra observatory. It is emanating from the massive and dense clouds of molecular gas that turn around the center of the Milky Way at distances varying between few tens to thousand light years from it. This emission was also already observed to vary and even to propagate with an apparent superluminal speed by the same research team back in 2010 using XMM-Newton and was then attributed to the reflection of a long outburst, about 300 years long, from Sagittarius A* (see http://www2.cnrs.fr/presse/communique/1894.htm). Taking advantage of Chandra exceptional high resolution the team of astrophysicists focused on the bright clouds which are less than 100 light years away from Sagittarius A* in projection towards the Galactic east in order to explore in greater details the drastic variations of the iron line fluorescent emission during the past decade. They found that the observed variations can be described essentially by two different behaviors: either a two-year peak propagating from west to east in one specific molecular structure (called the Bridge) or a linear change, either increasing or a decreasing, for the past ten years in all the other structures. Based on the density of the clouds which are reflecting the past emission of Sagittarius A*, the team concluded that these two behaviors are likely due to two distinct past events of Sagittarius A*. The animation above presents the main results of the publication. The first color image gives a static view of the neutral iron fluorescence line emission at 6.4 keV in the region, as seen by Chandra between 1999 and 2011. Both the position of the supermassive black hole Sagittarius A* (white cross) and the angular scale in light years (ly) are indicated on this image plotted in Galactic coordinates. Then the animation shows that the brightest regions are correlated with molecular materials which are moving at different velocities. In particular three groups of clouds are identified in the radio images of a characteristic molecular line: MC1 & MC2, G0.11-0.11 and The Bridge. The rest of the animation gives a high resolution view of the X-ray variations occurring in these clouds as seen by Chandra. First it shows an overview of the variations with three images corresponding to three different periods. This is also summarized in a composed color image where the emission detected is, between 1999 and 2003 in red, between 2004 and 2007 in green and between 2008 and 2011 in blue. Second, it zooms on the Bridge region showing the two-year peaked variation of this cloud starting in 2008 and propagating from right to left. 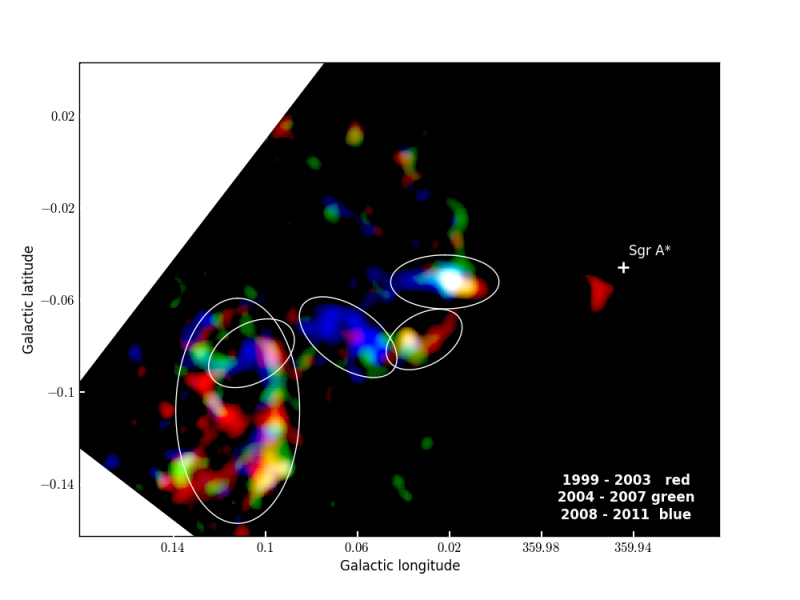 Third, it zooms on the MC1 & MC2 clouds which have been varying linearly from 1999 to 2011 with also a clear propagation from right to left, away from Sagittarius A*. The figure below shows a sample of the characteristic lightcurves of the different parts of the molecular clouds, located in the composite color image of the region where the 6.4 keV iron line emission detected between 1999 and 2003 is in red, between 2004 and 2007 in green and between 2008 and 2011 in blue. The plots give the 4 to 8 keV continuum intensity, in units of 10-6 ph cm-2 s-1, measured in 15″-size square regions within the identified molecular clouds, at different years. The two behaviors mentioned above are clearly visible in the lightcurves, with the inset 1) and 2) showing the two-year peak emission propagating along the Bridge and all other plots showing the ten-year linear rises or decays. This is the first time that such fast variations of the reflection component from the Galactic center molecular clouds, and in particular an event as short as a couple of years seen both in its rising and decaying phase, are reported convincingly. The events at the origin of these two past outbursts are still not understood but these results shed a new light on the behavior of the Galactic supermassive black hole Sagittarius A* and indicate that these and future observations will likely lead soon to a full reconstruction of the past few hundred years history of its activity. These results will be presented (oral talk) at the IAU 303 Symposium “The Galactic Center: Feeding and Feedback in a Normal Galactic Nucleus”, 30/9 – 4/10/2013 in Santa Fe, NM, USA, by M. Clavel (https://science.nrao.edu/science/meetings/IAU303-GC2013) and will be the subject of a Chandra News release in October 2013 (http://www.nasa.gov/mission_pages/chandra/news/sagittariusA-black-hole.html) as well as of a summary in the Research Highlights of the 2013 October volume N. 552 of Nature (http://www.nature.com/nature/journal/v502/n7471/full/502275a.html).